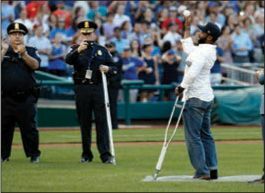 ▪ Special Agent David Bailey was greeted with cheers at Nationals Park last week as he hobbled across the infield on crutches, his foot in a boot, to throw the first pitch in the annual Congressional Baseball Game. Bailey had been injured a day earlier when, together with anothere of Rep. Steve Scalise (R-La. ), who was critically wounded in the shooting.